It’s a warm Monday evening in June, and Seattle Center’s grounds are buzzing. A dozen or so kids splash and run around the International Fountain, trying to predict when the supershooter jets will douse them, while a 20-something man pedals lazily around it on a unicycle. North of the fountain, a 4-year-old girl coasts on her push bike down August Wilson Way. A short walk east, the Artists at Play playground ripples with music and activity: Toddlers bang out notes on the Trimpin-designed sound fence, grade schoolers climb the tower and scream down the slides, tweens lounge on the play mounds. Above, a floatplane swings by the Space Needle. Not anymore. Leading up to its 50th anniversary in 2012, guided by its Century 21 Master Plan, Seattle Center started a transformation. 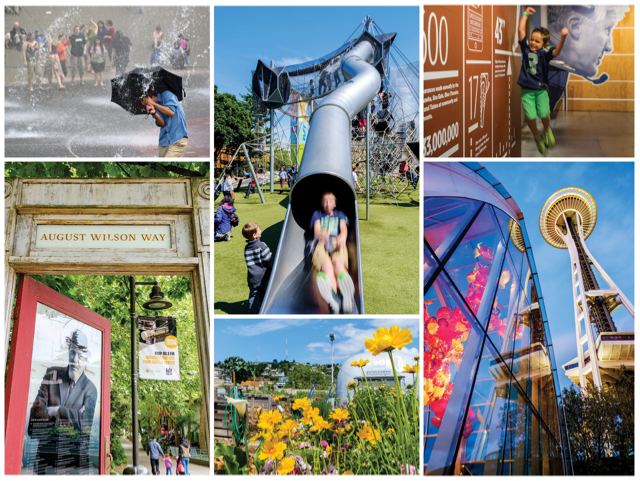 The Center House was revamped and rebranded as the Armory; the beloved but decrepit Fun Forest was replaced with a glass museum and stunningly inventive playground; and innovative organizations, from public radio station KEXP to the Gates Foundation Visitor Center, have made their home there. The result is an ever-evolving public space with more entry points than ever for families, offering play, discovery and learning — much of it available at no cost — on any day of the week. So here, just in time for summer, is our ultimate insider’s guide to the old-new regional treasure that has it all.